Looking for a Used RS 4 in your area? CarGurus has 43 nationwide RS 4 listings starting at $18,998. The Audi RS 4, introduced to U.S. shores in 2006 and based on the A4 sedan, represents the high-performance level of the German automakerâ? ?s compact sports sedan line. For the 2008 model year the RS 4 will be offered in a limited-production Cabriolet model, while the sedan will add two new trim packages. One might mistake the RS 4 for an A4, as the latter is the basis of the former, but it's unlikely. The bulging fender flares necessary to cover the RS 4's 1.5-inch-wider front track, 1.9-inch-wider rear, and 19-inch wheels are a giveaway, as is the RS 4's all-around 1.1-inch-lower stance. Integrated front and rear spoilers are telltale signs of the performance orientation of this Audi sedan. A glance through those 19-inch wheels reveals pizza-pie-size ventilated, cross-drilled 14.4-inch front brake rotors with 8-piston calipers and 12.8-inch rear rotors, all of which can haul you down from 60 mph to a dead stop in only 107 feet. If you ventured underneath the car, youâ? ?d spy the NACA brake ducts that direct air to those rotors to reduce their temperatures by 170 degrees at speed - you won't find those on a normal A4. A quick peek under the hood will no doubt result in shock and awe â?? neither a turbo 4-cylinder nor a V6 sits over the front axle. Rather, by means of some sort of secret arts, Audi engineers have shoehorned a 4.2-liter V8 into the A4's engine compartment. This all-aluminum, direct-injection, DOHC, 32-valve, high-compression V8 produces 420 hp, with 90% of its 317 pound-feet of torque available from 2,250 to 7,600 rpm, redlining at an awe-inspiring 8,250 rpm. All of this power flows through the only available transmission, a buttery-smooth six-speed manual. Audi claims 0-60 mph in 4.8 seconds, but Edmunds and Motor Trend reviewers did it in 4.5 seconds. The RS 4 is electronically limited to 155 mph. Once the clutch hooks up, a specially tuned version of the famed Audi quattro all-wheel-drive system powers the wheels. For the RS 4, the center differential was changed from a viscous unit to the faster Torsen differential, with a 40/60 rear-biased torque split, as opposed to the typical Audi 50/50 split, yet the full 100% is available to either front or rear axles. In addition to the handling dynamics of a rear-wheel driver, the RS 4 also incorporates Audi's Dynamic Ride Control, in which the diagonally opposite (front right to rear left/front left to rear right) dampers are linked with a gas-charged reservoir. This fully mechanical system adjusts shock valving according to the carâ? ?s dynamic forces â?? Audi says this drastically reduces lean, squat, and dive. Steering is exceptional, with some reviewers claiming the RS 4 displaces all-time-champ BMW in its road feel and precision. Audi uses its Servotronic system, which increases pressure based on vehicle and steering speed to offer great feedback and response during fast driving. Reviewers inevitably compare the RS 4's handling to its lighter rival, the BMW M3. Being a heavier car, the RS 4 handles in a much more composed fashion. A Motor Trend editor claimed it was such a competent handler as to be "one dimensional" in a video review, in that the car's mechanicals and not so much the driver directly engage the road - "more a sport sedan than a sport racer." Yet it certainly handles. At Edmunds it came in second to their fastest-ever slalom speed, posted by the very light and nimble Mitsubishi Evo â?? and that was only 0.1 mph faster than the Audi. What's your take on the 2008 Audi RS 4? Users ranked 2008 Audi RS 4 against other cars which they drove/owned. Each ranking was based on 9 categories. Here is the summary of top rankings. 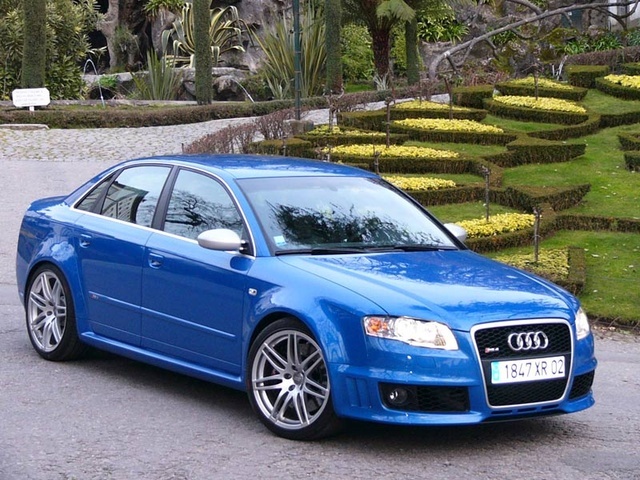 Have you driven a 2008 Audi RS 4?